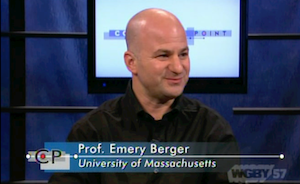 Interview on cyber-security with WGBY, our local PBS affiliate; downloadable MOV. Turtles, Wireless Transmitters Combined in Dual-Purpose Study, FOX News, Turtles to Test Wireless Network, ABC News, MIT Technology Review, Boston Globe, Globe and Mail, Jerusalem Post, and others. "DieHard" für Firefox: Browser mit Lebensversicherung, Sueddeutsche Zeitung; DieHard diminue les plantages, SVN Informatique; DieHard, the software, ZDNet.com and Slashdot. New Program by UMass Amherst Computer Scientist Prevents Crashes and Hacker Attacks: UMass press release, ACM TechNews, PhysOrg.com, Daily Hampshire Gazette. Intel highlights the benefits of using Hoard: Improve Performance with Thread Aware Memory Allocators. Sun concludes that Hoard is more space-efficient than their own allocators: A Comparison of Memory Allocators in Multiprocessors, June 2003. Policy-Based Memory Allocation: Doctor Dobb's C/C++ Journal, November 2005 (with Andrei Alexandrescu).